Fluorescent plastic microfibers that have been ingested by a bleached sea anemone, Aiptasia pallida. 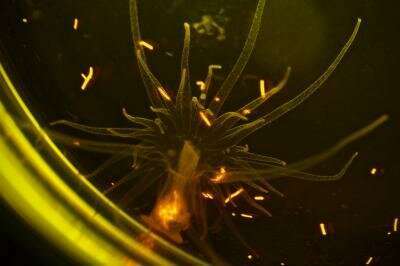 Tiny fragments of plastic in the ocean are consumed by sea anemones along with their food, and bleached anemones retain these microfibers longer than healthy ones, according to new research from Carnegie's Manoela Romanó de Orte, Sophie Clowez, and Ken Caldeira. Their work, published by Environmental Pollution, is the first-ever investigation of the interactions between plastic microfibers and sea anemones. Anemones are closely related to corals and can help scientists understand how coral reef ecosystems are affected by millions of tons of plastic contaminating the world's oceans. One of the most-common types of plastics in the ocean are microfibers from washing synthetic clothing and from the breakdown of maritime equipment such as ropes and nets. Microfibers are found across all the world's oceans and are beginning to appear in fish and shellfish consumed by humans. "Plastic pollution is a serious and growing problem for our oceans and the animals that live in them," Romanó de Orte said. "We wanted to understand how these long-lived contaminants are affecting fragile coral reef ecosystems. Plastics could be confused by the organisms for food and could also be carriers of other harmful contaminants. Since sea anemones are closely related to corals, we decided to study sea anemones in the laboratory to better understand effects of plastics on corals in the wild." Most laboratory research on plastic pollution uses tiny beads of plastic, not microfibers. So Romanó de Orte, Clowez, and Caldeira set out to determine whether microfibers are ingested by healthy sea anemones and by those that have lost the symbiotic algae that provide them with nutrients, a condition called bleaching. On corals reefs, bleaching is caused by increasing ocean temperatures due to global climate change. The research team introduced three different kinds of microfibers—nylon, polyester, and polypropylene—to both unbleached and bleached sea anemones both alone and mixed with brine shrimp. They found that when introduced alone, nylon was consumed by about a quarter of the unbleached anemones and the other two microfibers were not taken up at all. But when the microfibers were mixed with brine shrimp, about 80 percent of the unbleached anemones ingested all three microfibers. For the bleached anemones, 60 percent consumed nylon and 20 percent consumed polyester with no food present, and 80 percent took up all three microfibers when mixed with brine shrimp. It took longer for the bleached anemones to expel the microfibers after ingesting them than it did for the healthy anemones, although all microfibers were gone by the third day. However, in a natural marine environment, anemones and coral would continually be reintroduced to new microfibers, making the contamination a chronic condition of their existence. "Our work suggests that plastic pollution and climate change are packing a one-two punch for coral reefs," Caldeira explained. "When the reefs are bleached by hot ocean temperatures, the organisms are more likely to eat and retain plastic microfibers. It looks like the effects of global warming and of ocean pollution don't just add together, they multiply."